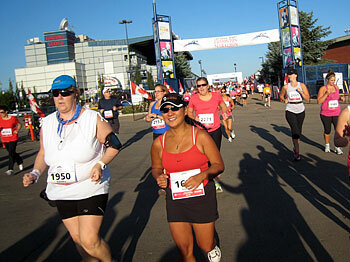 So you think you are ready to take on a full marathon or even a half marathon? Well I have good news and bad news. First the good news, if you do the training almost anyone can run a half marathon or even a full marathon without too much difficulty. 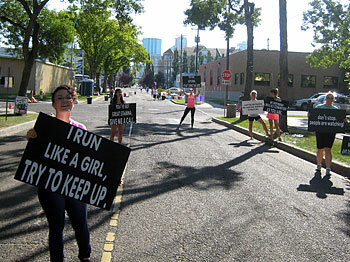 Now the bad news, as with most races, training for your first half marathon or full marathon is a lot of hard work. Not only do you have the strain on your body of the long runs, hill and speed training, but you also have a significant time commitment for your training. If you take a look at the Full Marathon Training Schedule, or the Half Marathon Training Schedule you will see the full marathon schedule is 18 weeks of training and the half marathon is 16 weeks of training. In both cases this assumes you have at least some running base. If you are starting running from scratch (you are ambitious) you will have to add on a couple of weeks to build up to Week One. So assuming you are willing to commit the time to training, and assuming you are prepared to suffer the physical strain, then how do you get started. Well that depends. The first thing you need to decide is what time you would like to run your first marathon or half in. I know, you just want to finish. That’s fine but how you train will depend on the time you want to do. For example if you are looking at running a 3 hour plus half marathon or a 6 hour plus full marathon then you probably aren’t going to do any speed work or maybe not even hills. However if you are looking at running the full marathon in say 4 hours or the half marathon in 2 hours then you will need to do both speed work and hills. Remember you can adjust your training either faster or slower throughout the schedule. Take a look at the Running Training Pace Calculator and enter the race distance (42.2 km or 26.2 miles for the full marathon and 21.1 km or 13.1 miles for the half marathon), and the time you would like to complete the race in. Then select whether you want the results in minutes per kilometer or minutes per mile. The two important numbers for you to look at are your long run pace and your tempo run pace. Your shorter runs on the running schedule should be done at a tempo pace and your long runs, usually on Sundays, should be at the long run pace. It is important to note that the long runs are for time on your feet. Running fast on your long runs defeats the purpose of the long run. You will get better results going slower on your long runs and building speed on your speed runs. Remember the running pace from the pace calculator is at a continues pace. If you run ten and ones (10 and 1s) you need to adjust (see running ten an ones). Hill training will build up the strength in your legs it is important to do this before you do speed training because speed training will break them. Don’t attempt speed training until you have done hill training, and don’t do hill training and speed training in the same week. Hill training is exactly as it sounds. Find a hill and run up it! Make sure you follow the schedule, just because you feel good doesn’t mean you should run an extra hill. That is how you get an over use injury! As for speed, there are a couple of different techniques for incorporating speed into your training. Fartlek’s is not only a cool word to say at a party but is also an excellent technique. Basically a Fartlek is when you run as fast as you can for a given distance, say 100 meter (or to the next lamp post), then run slowly till you recover, and then repeat. This gets your legs used to turning over quickly. Another method is Yasso 800’s. 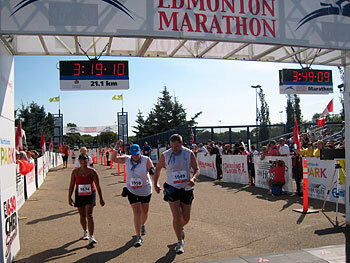 This method is also a great indication of your full marathon or half marathon finishing time. How it works is you warm up, and then run 800 meters in your marathon time converted to minutes and seconds instead of hours and minutes. For example if you are planning on running a 4 hour 15 minute full marathon, then run the 800 meters in 4 minutes 15 seconds. You would start by doing a couple of Yasso 800’s then build up each week until you are doing 10 repeats. If you can do 10 Yasso 800’s in 4 minute 15 seconds you should have no trouble with a 4 hour 15 minute marathon or a 2 hour 8 minute half marathon. You’ve all heard about hitting the wall, and seen the movie where the star breaks through with sheer determination. Well, it’s been my experience you hit the wall around 2 to 2:15 hours into your run (both training and race). It’s easy to not hit the wall, but once you do, you're pretty much walking the rest of the race. What the wall is, is basically your body switching food sources and burning the sugars you consumed during your run. If you are going to be done in 2 hours or less then you don’t need to eat during your race or training. If you are going to be running for more than 2 hour (which most of us are), then you need to eat during your run. What do you eat? Well that’s up to you. There are lots of sports sugary snacks that are supposed to make you run faster, I personally use wine gums. Why? Because they taste good! The only important thing is to experiment during your training and DO NOT TRY ANYTHING NEW DURING THE RACE! So that’s it. If you follow the schedule, do all the training and have the will to finish, almost anyone can run a half marathon or a full marathon. So dig in and good luck.